Like humans, our Earth doesn’t have a birth certificate which could record its age. However; a discipline of Earth Sciences, ‘geochronology’ deals with dating the rocks of the Earth’s crust and also that of its neighbours such as moon and meteorites etc. to know the age. 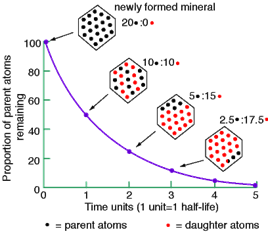 Through a technique called ‘radiometric dating’ it is now shown that long lived isotopes of certain parent radioactive elements (e.g. Uranium) present in a rock, decay into other daughter elements (e.g. Lead) at predictable rates. The figure below explains the radioactive decay. This radioactive element, which was created long before our solar system existed, remains in trace amounts within the Earth. During the formation of a rock, its atoms get trapped within. These atoms decay as the rock ages. Thus, with known half-life and decay rates and by measuring the initial quantity of parent element within a rock, a geologist is able to know how long it took for the elements to decay, thus figuring out the age of the earth. Lunar rock samples and meteorites, which are fragments of asteroids and represent some of the most primitive material in the solar system, e.g. Canyon Diablo of Arizona have been dated to 4.53 to 4.58 billion years, which constraints the earth to 4.6 billion years old. Earth’s oldest rocks are as old as 4.03 billion years of age. These include the Acasta Gneisses, located in northwestern Canada, and the rocks of Jack Hills, Australia, which contain the oldest known minerals on Earth - a 4.4 billion-year-old zircon. Interestingly, the Indian subcontinent also hosts some of the world’s oldest rocks. The Archean Dharwar Group of Karnataka in India is one amongst these.